Can anyone catch Korea in the global TV market? Maybe only the Chinese… | What Hi-Fi? The latest worldwide TV sales figures make pretty gripping reading when it comes to charting the power-play between the top consumer electronics companies. For while the headline news is that sales of LCD TVs fell for the first time last year, albeit by just a single percentage point, it's clear that plasma TV is definitely on the slide, suggesting Panasonic's thinking on getting out of this market-sector is a pretty shrewd move. And even more staggering is the shifting balance between the once-leading Japanese manufacturers and their rivals from Korea and China: in 2012, one company – Samsung – outsold the combined efforts of Japan's big three by almost 50%. While both Samsung and LG increased TV revenues, those of the Japanese manufacturers – which after all have committed themselves to selling higher-ticket models in an effort to regain some profitability – took a serious tumble. The figures, just released by market analyst NPD DisplaySearch, show just how shaky things are looking for Panasonic, Sharp and Sony. For while Samsung maintained its market-leading position with a 27.7% share by revenue, up from 2011's 24.8%, and LG rose from 13.8% to 15% to maintain second place, third-ranked Sony fell from 11.2% to 7.8%, Panasonic from 7.8% to 6%, and Sharp from 6.6% to 5.4%. In other words, Samsung saw 6% growth year on year, and LG 4%, but Sony tumbled by 34%, Panasonic by 26%, and Sharp by 22%. And it's not just the South Korean rivals threatening the future of Japan's TV business: as previously reported, Chinese TV manufacturers are growing fast, accounting for a fifth of all global TV revenues last year. Or in other words, more than the Japanese 'big three' put together. Much of that strength has been built on sales in the Chinese domestic market, which is now the world's largest: Chinese consumers bought some 52m TVs last year, or more than 22% of global TV sales. But now those Chinese companies are looking overseas, with aggressive plans to target worldwide expansion, despite falling demand in developed regions, and slowing growth even in the so-called 'emerging regions'. Overall demand in mature markets was down 18% year on year: sales in Japan plummeted 68% last year, while those in Western Europe were down 15%, and volumes also fell in areas such as Asia Pacific and Latin America. Only in Eastern Europe was their strong growth, with sales volumes up 17% fuelled by digital switchovers. Just over 203m LCD/LED TVs were sold in 2012, accounting for 87.3% of the market, while plasma TVs saw a 23% decline: around 13m were sold, taking a 5.7% share of the global market. Only CRT TVs fell further, by 38%, but there are still more CRT TVs sold worldwide than plasma models: 16m non-flat TVs found a home in 2012, along with 50,000 rear-projection models. NPD Display Search says it's cautious in its outlook for LCD TV sales growth this year, despite the significant drops in demand for plasma and LCD models, Director of Global TV Research Paul Gagnon saying that 'The growth in emerging markets was not nearly enough to offset the decline in some of the world’s highest volume regions. 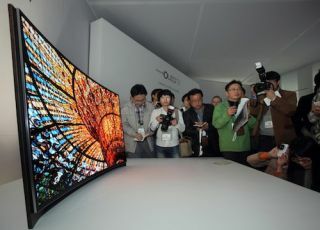 But if the overall picture for the market is cautious, things look pretty bleak for the survival of Panasonic, Sharp and Sony in the global TV market. Samsung and LG between them took nearly 43% of 2012 global TV revenue, and are not only leading their Japanese rivals but pulling away, while fast-growing Chinese manufacturers are – to say the very least – snapping at the heels of what were once the market-leaders. It's going to be interesting to see whether Sony's Kazuo Hirai and Panasonic's Kazuhiro Tsuga can turn around their companies' TV divisions, and get them once again making money – or whether their strategies, however painful, will turn out to be too little, too late.